This book will introduce you to desktop publishing and shows you how you can create your own brochures, books and documents. It is primarily focussed on programs which operate under Microsoft Windows, although some are also available for the Macintosh. There are many software programs which can help you. Unfortunately, there isn’t a great deal of help available to advise you on which programs would be best suited to your needs. This book is designed to fill that need. It will not show you how to operate any specific piece of software but it will tell you the things which it can do and what its strengths are. In this sense, it is a concept book to show you what is available and how a program may be able to fill your specific needs. First, you will get an introduction to word processing, fonts, file formats and the concept of WYSIWYG. It shows you what to expect from typical word processing programs. It covers the heavyweights such as Corel WordPerfect, Microsoft Word and some of the less popular programs. You will be introduced to how colour is handled, especially by commercial printing houses. You will learn how to create portable documents which can be read on different computer operating systems and can also be used to prepare and send documents to commercial printers. There are many introductory publishing programs which will enable you to create a wide variety of print documents and these are covered in a chapter called "Soup to Nuts" Publishing Programs. You will then be taken on a tour of the heavyweights in software publishing and layout programs which will help you to create books, newsletters, brochures and advertising material. There is a chapter on some specialty programs which will be useful if you are engaged in publishing research papers or foreign language texts. Voice dictation can save you countless hours of pounding at the computer keyboard and you will learn about some of the leading programs. In addition, you are shown how Optical Character Recognition (OCR) can help you scan and import written text on paper into your word processing files. Finally, there is a chapter on the all-important topic of managing your documents. The book concludes by giving you a quick glimpse of the next exciting step in digital publishing; namely, how to publish your own eBooks. Introduction: What is Desktop Publishing? 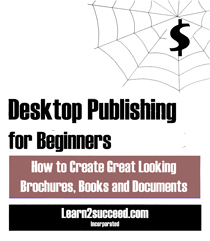 Desktop Publishing for Beginners: How to Create Great Looking Brochures, Books and Documents by: Learn2succeed.com Incorporated: Softcover; 114 pages; ISBN: 978-1-55270-455-4 published in 2012; $19.99.